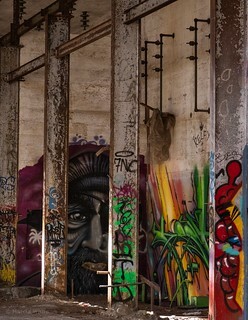 The ever changing colorful Graffiti art captured in the old abandoned power station in Jordan River, Vancouver Island, British Columbia, BC. The original two-storey powerhouse, built in 1909, was on the east side of the river. In 1971, a new power plant was built on the west side of the river with a far greater production capability than the original system. Today, this grand 341 feet long architectural structure still stands, its interior gutted and decaying but revived by the many colourful displays of graffiti art.